As self-serving as it is, one of the things I love the most about our pair of China Buff geese is that they still like to be with me. When the weather cooperates, which has not been frequently, I can loose them from their yard. Dutifully, they follow me to the flooded part of the lawn to get their "bath". (We are hopeful to have the money to have a proper pond dug for them in later summer or early in the fall.) 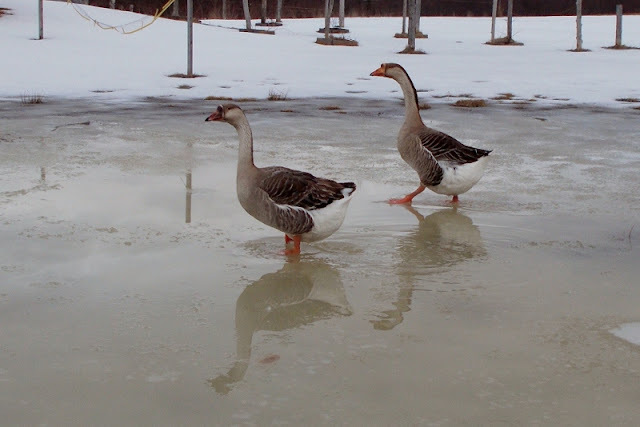 Not as friendly as the goats or chickens, our geese will stay in close proximity to me. They like me to be within 10-15 feet of where they are. When I get further than that, they begin honking and tag along to wherever I am heading. If I want them to follow me, I just begin walking away. I can get close enough to touch them, but they prefer if I merely keep them company and keep my hands to myself. They tolerate my picking them up, but they certainly do not like it. 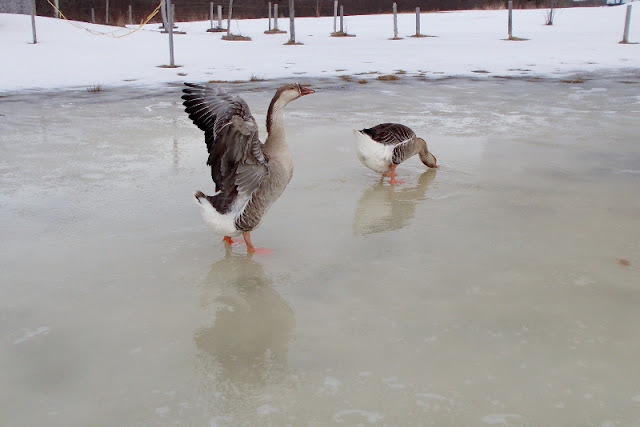 At bath time, our geese dunk their heads to wet them. They slosh water down over their backs, wetting their feathers. Then, it is time to preen each feather into place. Once preening is complete to their satisfaction, they open their wings and flap madly to dry themselves. It is a little sad that our geese do not know they can fly. They have never really tried to and we have never clipped their wings. Once last summer, Caitlin took off running towards me, caught some lift and managed what amounted to a very long leap across the back yard. She managed to get about 5 feet into the air. She looked as startled as I did. We watched to see would they continue, but flight was abandoned for policing the other yard occupants. Can you tell them apart? Justin's bill has a bright, orange nub on the top of his. Caitlin's bill is smaller and colored black. Justin is slightly heavier than Caitlin, too. Caitlin's more vocal of the two. If there is any doubt who is who, Justin will be the one with his neck straight out, hissing, and charging towards Sean or any unsuspecting stranger nearing his nesting site. I think Caitlin is the one closest to the camera in the last picture. I had to chuckle imagining both of your faces when she caught some air! I did not want geese for that same fear, Tammy, but ours have remained friendly as they grew. They are definitely more territorial around their nest, though! How lovely! I just can't imagine standing in ice water to bathe! But they look so happy to do so.